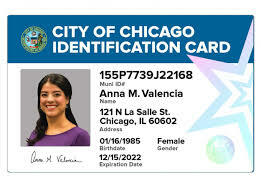 CHICAGO CITY KEYCARD ID: Get your FREE City of Chicago CityKey ID Card this Saturday, Sept. 15, 2018 at the Little Village Community Council, 3610 W. 26th St. from 10 a.m. to 3 p.m. No appointment necessary. City Clerk Anna M. Valencia is scheduled to be here. 1. Must prove that you live in the City of Chicago with a utility bill, a bank statement, or an envelope with your address on it. It must be within 30 days. 2. Must also prove your identity. This part is a point system with things like an ID, Driver’s License, TVDL, passport, or matricula. 3. The CityKey Cards, offered to eligible Chicago residents, can be used for identification, public transportation, and discounts all around the city. 4. The government issued ID comes with a number of benefits, including for people who are homeless, or in the country illegally. 5. Getting a CityKey is simple and only takes about three minutes, city officials said. To qualify, you'll need to provide a photo ID (unless you're under 14), your birth date and proof of address. 6. The first 100,000 cards will be issued for free. After that, it will cost Chicagoans $10, and $5 for kids. Seniors will always be free.